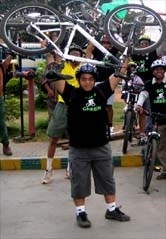 21Nov12, GoGreen Group shooting a video for Suvarna 24x7's "Wheels on Road" show. - GGI-Group size: 4000+ Professionals, Increasing on day to day basis, Come & join us 2 serve Mother Nature. 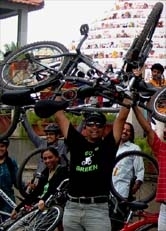 We are requested to have TREK bikes & 10 GGI's for the shoot. 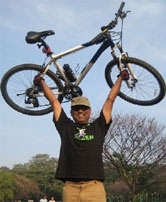 We planned to meet @ Sobha Tulip by 6:00am, Wait went on as couple of riders along with the TV Channel members didn't turn up. Being a week day, we wanted to close the shoot ASAP and run to our office their fore decided not to wait instead started of for Thurahalli forest. On the way we saw Suvarna TV along with their crew members going towards our meeting point. We reached much before the cars reached the spot. Very quickly we started off the shoot starting from road shoot then their after went into the forest, Had couple of trail shoots between the neilgeri trees after that the Anchor of the show "Veena Ponnappa" intervied Mr. Hemanth Sha owner of Jayanth Cycles then GoGreen Rao & came out of the forest & Concluded the last shot was shot on the road, It was almost 8:30am when we started heading back to B'lore on the way we had good break fast at our usual joint. It was G8 & refreshing morning that we started the day. We were been told about the show relaying dates which was set to be 25Nov12 @ 8:30pm.